I haven’t figured out yet why exactly I like dystopian novels so much. But I love them, definitely. Maybe it has something to do with my background in sociology? Divergent takes place in dystopian Chicago, divided into five factions: Candor (the honest), Erudite (the intelligent), Amity (the peaceful), Dauntless (the brave), and Abnegation (the selfless). The city was initially divided because it was believed that the presence of each of the five traits would lead to peace; the main character, Tris, is raised in Abnegation, but the obligation to be selfless does not come naturally to her. At age 16, everyone is allowed to choose their faction, though it is assumed most will stay where they were raised. 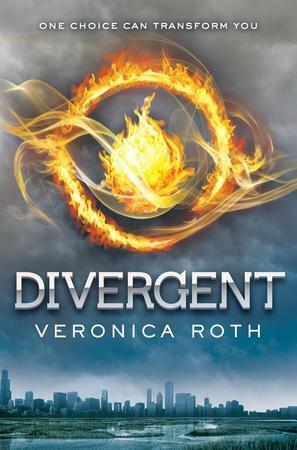 Tris shockingly does not remain in Abnegation – and neither does her brother, Caleb. This is the author’s first novel, and it is phenomenal. The plot took a turn from where I expected it to go early on, so it was a while before I was convinced that the story would play out well. It was good writing, though, and the story was captivating. If you like dystopian literature, pick this up! The second in the series, Insurgent, was released earlier this year. You sold me, so I grabbed it from Amazon and read it this afternoon. At times I felt like I was reading Ender’s Game, other times I felt like it was a Hunger Games book, and parts reminded me of Dune. But it was it’s own book, in the end. Loved it! Maybe I’ll read Insurgent this evening. Glad you liked it! I haven’t read Insurgent yet, so let me know how it is (but no spoilers).